This one-litre red blend from San Rafael is a Malbec Syrah Bonarda fruit bomb. Funky Funckenhausen red blend is good funky. Designed by Funckenhausen Vineyards for the US market – where size does matter – it’s now available to buy in Argentina. At first sniff, I thought it was a Bonarda due to its rose nose. Sweet red cherry and plum dominate, more floral notes thanks to the Malbec then popped up, and the upshot was a fresh, young red blend that will easily see its way through an asado. What’s interesting about this winery is that there are three generations crammed into its 10-year history. Aged 70-something, Kurt Heinlein’s entrepreneurial spirit reared its head and he turned his hand to wine. That was a decade ago. Grandson Alejandro Leirado Heinlein now takes care of marketing, and has very much been the player in guiding winemaker Mauricio Lorca towards targeting a younger drinking market. 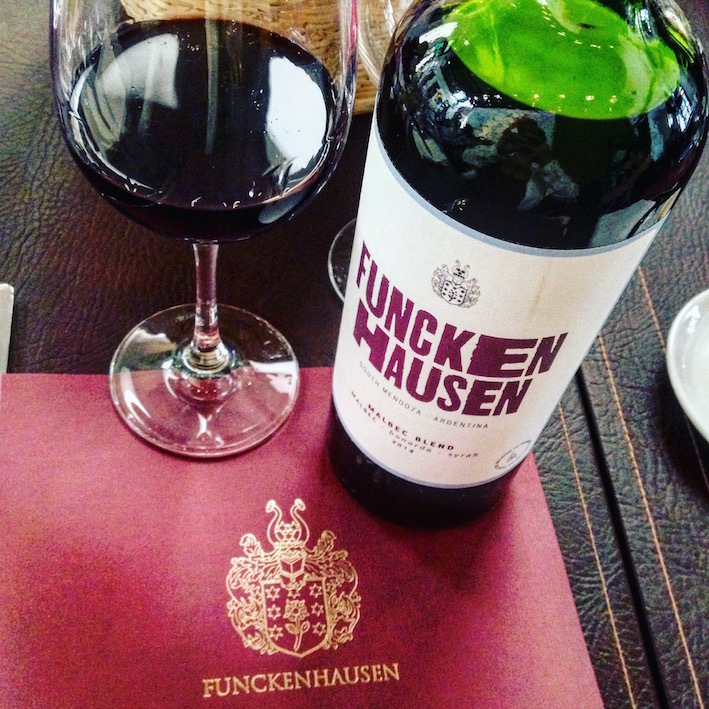 The upshot is Funckenhausen Red Blend 2014, Funckenhausen Vineyards, San Rafael, Mendoza, 120 pesos. 50% Malbec 35% Bonarda 15% Syrah. The Syrah is of particular relevance to Kurt, as those were the first vines he planted. One thousand millilitres of fun! What are you waiting for?